Ross Castle, Killarney. 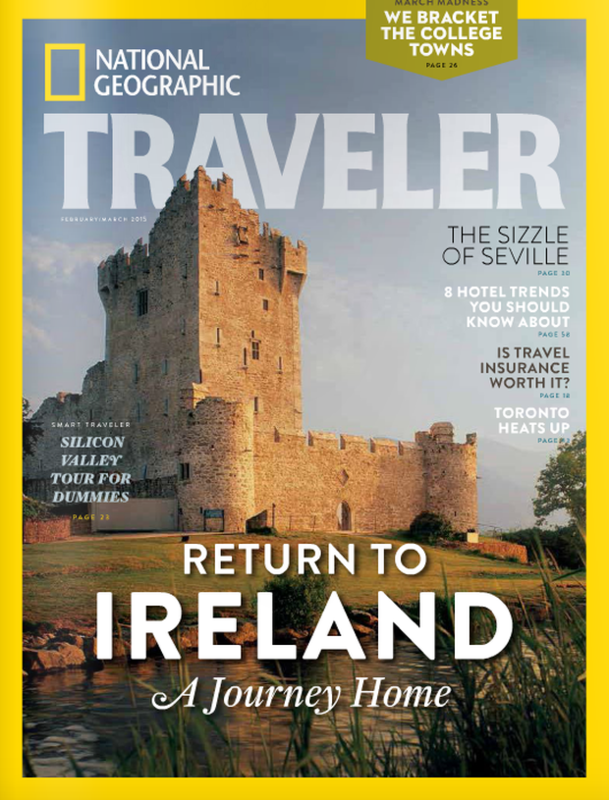 National Geographic Traveler features Kerry as its Feb/March 2015 cover story. 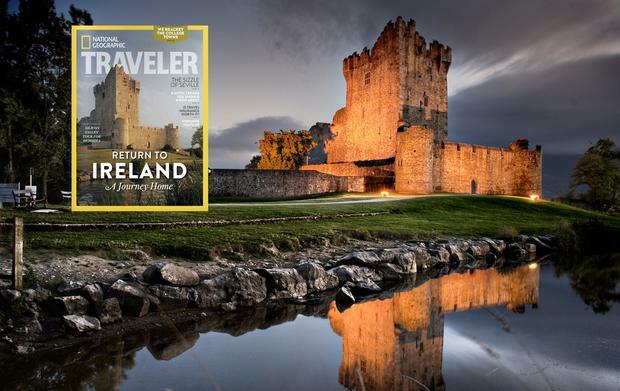 The February/March edition of National Geographic Traveler features a spectacular cover shot of Ross Castle in Killarney. It's not every day that one of the world's most celebrated travel publications opens its cover story in Lacca West. Nor is it every day that the writer of that cover story is Hollywood actor, and acclaimed travel writer, Andrew McCarthy. Welcome to the February/March edition of National Geographic Traveler. Currently hitting newsstands across the US, the cover features a spectacular shot of Ross Castle in Killarney, accompanied by the headline: 'Return to Ireland - A Journey Home'. Inside, McCarthy describes a trip through the Kingdom over the course of an 11-page spread featuring mouthwatering images of Kerry and its "lyrical hills". "Several miles from the sea in the west of Ireland, outside the market town of Listowel, along county road 555, a path cuts into the overgrowth and up the hillside," he writes. The author visited Kerry Kingdom in search of his roots, ultimately tracing his ancestors to a small farm in the parish of Duagh, a few miles south of Listowel. "I’d be able to go and walk the land that my great-grandfather had walked before he left Ireland for good and came to America," he writes. "The idea suddenly thrilled me." Over the course of his visit, he climbs Carrauntoohil (“People die up there, Andrew," his father-in-law says. "Are you sure you’re fit enough?”), visits Kenmare and Ballinskelligs, and journeys out onto the Dingle Peninsula. "You don’t get to Dingle by accident; it is on the way to nothing but itself." McCarthy's wife is from Dublin, and he is a regular visitor here. As an actor, he is best known for his roles in 1980s movies Pretty in Pink and St Elmo’s Fire, but has latterly forged a reputation as a travel writer. 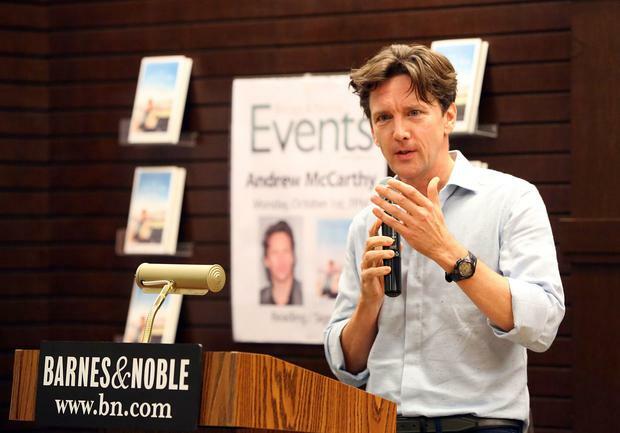 Andrew McCarthy, photographed in 2012. The story will delight Tourism Ireland, which is rolling out an extensive programme of promotions in the United States for 2015, hoping to build on a record year for transatlantic visits. 2014 was the best year ever for tourism from the United States, with visitor numbers increasing by 13pc over 2013 – 134,000 additional American visitors during the year. The Wild Atlantic Way and Northern Ireland's Causeway Coastal Route will continue to be a major focus of promotional activity this year, as will the new Dublin Discovery Trail. McCarthy's feature is adapted from Journeys Home, a book of essays featuring 26 authors, and published by National Geographic Books this month. "I can feel my resistance softening to the idea of Kerry as my homeland," he writes. "How can it not feel right to be connected to all this?"